Joe Nott Band Live Show and Album Release Party at Garcia’s In Port Chester, NY! Garcia’s at The Capitol Theatre! FREE LIVE SHOW! Saturday, August 27th @ Casa Del Sol in Nyack, NY! Casa Del Sol in Nyack, NY!!! Joe’s Irish Pub in Beacon, NY!!! Friday, November 6th: The Joe Nott Band will be opening up the show for The Jason Gisser Band at the Paramount theater in Peekskill!!!!! JNB will go on at 8pm sharp, so don’t miss it!!!! Click here for more info and to RSVP! 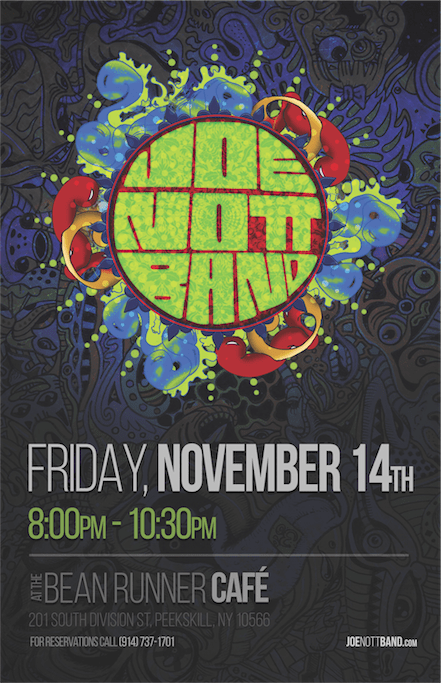 Joe Nott Band Live @ The Bean Runner in Peekskill, NY Friday night, November 14nd, show from 8:00PM – 10:30PM.